Leisure and tourism in County Tyrone could be boosted by reopening a former railway line as a cycling and walking route. 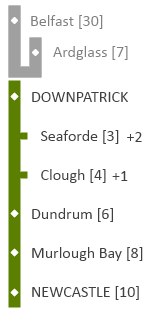 The Great Northern Railway branch line ran from Cookstown, through Coalisland and into Dungannon. Built in 1879, fully enclosing the Lough Neagh basin with railway lines, this branch was closed in 1959. Creating a new Greenway for walkers and cyclists, local ramblers and active tourists, can create new economic possibilities and health benefits in the region. The towns of Cookstown, Moneymore and Magherafelt were once linked by a railway that now lies derelict. The old line, which winds through the Mid Ulster countryside, could be regenerated to provide a high quality 11 mile walking path and cycle route. This could be an important part of an orbital pathway around Lough Neagh, and a key tourist route west of the Bann. Nestled between the River Bann and the Sperrins, a disused railway line snakes between the towns of Magherafelt, Maghera, Kilrea and Garvagh. The line was built and operated as the Derry Central line, which fully closed in 1959. The route is still visible today, and presents an opportunity for regeneration. A new cycling and walking path, or Greenway, could be opened on the former trackbed, providing a healthy infrastructure for the Mid Ulster area and a boost to tourism. Magherafelt, Draperstown and Desertmartin are linked by the former Draperstown Railway, which shut in 1950. Local communities could benefit from regenerating this route and creating a new Greenway to allow walking and cycling into the County Tyrone countryside. This Greenway proposal is part of a wider network over 600 miles across Northern Ireland which, if realised, could bring activity tourism spend to the Draperstown area. A new Greenway connecting Randalstown and Toome is a project which could bring health and leisure benefits to the local population, and be a key tourist link on the north shore of Lough Neagh. This was the route which first interested me in the former railway lines in Northern Ireland. The railway viaduct dominates the eastern approach to Randalstown, which in recent years had been redeveloped to provide a scenic walkway. This was a link across the River Maine for the Belfast and Northern Counties railway line stretching from Antrim, through Randalstown to Toome and onwards to Magherafelt. I traced the route on Google Maps and began to think of this entire proposal. Completing the main line of the former Belfast and County Down Railway, there is potential to open a 10-mile dedicated cycle and walking path from Downpatrick to Newcastle. Opening access to the Mourne countryside can help to encourage active tourism and encourage healthier lifestyles in Northern Ireland. Starting from the working heritage railway in Downpatrick, the track bed heads out following near the line of the Ballydugan Road towards Clough. As the proposed pathway crosses the A25, there is potential for linkages to Clough, Seaforde and its Gardens and Tropical Butterfly House. The line then turns South West towards Dundrum Bay, beginning one of the most spectacular walkways Northern Ireland could boast. The old line hugs the coast, extending into the bay at one point (see picture). Dundrum Bay lies at the edge of the Murlough Bay Nature reserve, lending some wonderful tourism potential to the route. A new pedestrian and cycling greenway route through Downpatrick would link the historic town with Belfast, and provide a quality tourist trail from Northern Ireland’s captial city to the Mourne Mountains. The best place to start detailing the vision for a network of Northern Ireland Greenways is with a town already benefiting from a traffic-free cycling and walking path, the 7 mile Comber Greenway. This popular route traces the old Belfast and County Down line with minor diversions to account for interim development. The Comber Greenway is heavily used for walking, leisure cycling and commuting, and includes a number of nodes such as the Billy Neill Soccer Centre of Excellence, the retail and business park at Dundonald, and a direct link into the heart of Belfast. Northern Ireland’s disused railway network is a forgotten piece of industrial and rural heritage being lost to time. Over 600 miles of track bed lies dormant, winding through spectacular countryside, linking villages, towns and cities, major attractions and workplaces. It represents a major potential tourist draw begging to be developed. While our population faces a growing obesity problem, a major plank in the fight for healthier lifestyles sits quietly waiting for its moment to shine. Town and transport planners are aware of the legacy of the railways in Northern Ireland. Brief mention is made of the potential for using former lines as new roads to move cars into and out of our congested town spaces. Yet the experience of the Comber Greenway in Belfast shows what is possible when urban and rural space is opened to walkers and cyclists, away from the noise, hustle and danger of roadside paths. Providing a backbone infrastructure across Northern Ireland of traffic-free, high quality walking and cycling paths can give a safe space for families, commuters and tourists for leisure. Cycle deaths and serious injuries continue to plague our road networks. While providing a new traffic-free network will not prevent this, a signature project to provide safe cycle space across Northern Ireland can be an exemplar to local councils; providing practical evidence of how developing safer traffic-separated cycle lanes within urban areas can only increase cycling take-up, with the associated benefits to the health of the population. This is a vision which can only be realised through true community drive and spirit. Given the economic difficulties faced by Stormont and local councils, public money cannot be relied upon to deliver. Alternative funding sources must be explored; local communities need to join to lobby for action. While this cannot be an ‘all or nothing’ project, the true value in the long run to the economy will be in a fully integrated traffic-free network for walking and cycling in Northern Ireland, to encourage new forms of tourism, and to begin to tackle the growing health issues we face. As a project this is an opportunity for balanced investment between East and West of Northern Ireland, for rural investment balanced against urban, and to invest in border areas. The disused railway network is not fully intact to this day. With the mostly rural setting, some sections have been lost to agricultural lands, building development, industrial estates, and former railway buildings being renovated into domestic dwellings. These issues will need to be tackled if a continuous network is to be realised. Discussions between landowners, local communities and political stakeholders are vital to find solutions, whether by route diversions or access agreements. Linking traffic-free paths across developed towns and cities is a challenge, but should be pursued with vigour to add safety and the potential for town renewal and redevelopment. The railway network was pared down to the bone in the 1950s and 1960s. A generation who experienced the life and times of steam rail travel in Northern Ireland is still with us, ready to share their memories and add value to the heritage of our forgotten infrastructure. We have a responsibility to tap this resource before it is truly forgotten to history. The value to future generations of a link with our past, and presenting a pride in our heritage, will add to the hook for an active holiday sector which such a network could deliver for Northern Ireland. The challenges are immense, but consider the benefits. 600 miles of traffic-free paths, trailing to every corner of Northern Ireland. A spectacular selling point to promote tourism in Northern Ireland, and an opportunity to create jobs around the outdoor activity and hospitality sectors. New connections between villages, towns and cities, with an alternative to private car travel. Every major Northern Ireland tourist attraction linked by this network. Safe space for individuals and families to walk or cycle, jog or walk the dog, opening access to our countryside. Over the next few weeks I’ll take each potential Northern Ireland Greenway route, provide an overview, route maps on Google, the advantages, the history and the setting, and open the ideas for discussion. Northern Ireland already has some fantastic resources for segregated cycle and walking paths, running from Newtownabbey through Belfast to Lisburn, the Comber Greenway, the developing Connswater Community Greenway project and the Newry Canalway to name a few. There is an opportunity to uncover our hidden past, build for a healthier future, and provide a world-class walking and cycling infrastructure to sell to the world.